Brian Purcell was one of five witnesses that also included three politicians at the Tribunal today. THE FORMER SECRETARY general of the Department of Justice has told the Disclosures Tribunal that he was aware that then-garda commissioner Martin Callinan was going to meet a Fianna Fáil TD in what was the infamous car park meeting. The Tribunal heard from five witnesses today, including three current and former TDs, the former top civil servant in the Department of Justice and a retired garda. Brian Purcell, the last witness of the day, was asked at length about his interactions with Callinan over these issues in 2013 and 2014. That car park meeting on 24 January 2014 between Callinan and John McGuinness came against the backdrop of the work of the Public Accounts Committee, of which McGuinness was chairman. Last week, the Tribunal heard evidence from McGuinness about this meeting, and he alleged that Callinan told him McCabe had sexually abused family members. Callinan denies ever saying this about McCabe in the car park meeting, but he has yet to give evidence at the Disclosures Tribunal. Purcell, in his role as the top civil servant in the department, had regular conversation with Martin Callinan and said he spoke to him both the night before the meeting, and soon afterwards on the phone. He said that, as far as he was aware, the purpose of the meeting was for Callinan to put forward the case for Maurice McCabe not to give evidence at the PAC the following week. McCabe, at the time, was highlighting deficiencies within the system and McGuinness had chosen to pursue the matter at PAC. Just a day prior Callinan had appeared before the committee and referred to the actions of whistleblowers as “disgusting”. Purcell texted Callinan after the hearing and said to him “well done, exceptional performance”. He told the Tribunal today that he did this because he “knew the commissioner was having a tough time”. Both Purcell and Callinan were “concerned” at the idea of McCabe giving evidence to the PAC because confidential information including people’s personal details could be divulged. Furthermore, they were worried it would set for a precedent for gardaí for the “politicisation of operational issues”. And, when asked directly if he was aware of any smear campaign against McCabe, Purcell said he had no knowledge of such a thing. He also said he didn’t tell then-Minister for Justice Alan Shatter about these interactions with Callinan over the car park meeting. 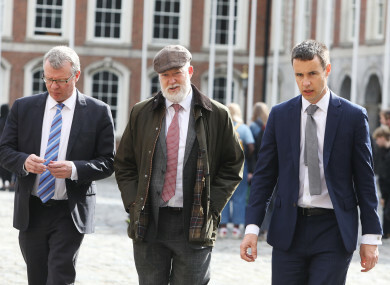 Former Labour TD and minister Pat Rabbitte earlier told the Disclosures Tribunal that his ministerial driver – a retired garda – told him in 2014 about rumours that Maurice McCabe “couldn’t be trusted” and that McCabe’s “own colleagues believed he couldn’t be trusted with children”. Rabbitte gave evidence that John Kennedy, who retired from An Garda Síochána in 2006, told him this after a radio interview he gave at the time where he mentioned having previously had dealings with McCabe. Kennedy, giving evidence later in the day however, refuted the claims made by Rabbitte and called them “absolutely despicable”. The former Labour leader said that Kennedy told him he had heard it “through the grapevine”, which Rabbitte took to mean the garda grapevine of information. Rabbitte said that he doesn’t believe he was told this for malicious reasons on the part of the driver, but that he was merely making him aware of the rumours that were out there about McCabe. “My concern was the message, not the messenger,” he told the Tribunal. He said he chose not to pass on the information he’d received widely, as he believed that he didn’t want to “propagate these [rumours]” or “give them legs”. Rabbitte added that, if Kennedy does disagree with him over what was said in the car, then he thinks “it’s a difficulty with Mr Kennedy’s memory”. Giving evidence in the afternoon, Kennedy said that he had very little contact with gardaí after his retirement and that he had not heard any rumours about Sergeant Maurice McCabe from old colleagues or within Leinster House. Describing Rabbitte as “grumpy at times”, Kennedy said that he never discussed Maurice McCabe with the Labour TD at all when he would drive him from place to place. Earlier, Fianna Fáil leader Micheál Martin told the Tribunal that a party colleague told him about meeting then-garda commissioner Martin Callinan in a car park, and being told that Maurice McCabe was not to be trusted and a child abuser. Martin said he had talked to TD John McGuinness about the matter in February 2014, a month after the car park meeting, and that McGuinness had given him brief details about the conversation with Callinan. The Fianna Fáil leader said that – after meeting McCabe himself and hearing his evidence of deficiencies in garda investigations – he chose to ignore the rumours that were being spread about McCabe and focus on the “substantive evidence” he had been provided. Martin said that he was “impressed” by McCabe having met him. He said: “He impressed me as a witness. He had substantive material. He made it clear to me he wasn’t leaking to the media or looking for notoriety. It wasn’t all bluster. It wasn’t all talk. He had chapter and verse. When asked if was shocked by the details given to him of the car park meeting, Martin said he believed it would have been “wrong” of Callinan to say those things about McCabe. Minister for Housing also gave evidence to the Tribunal very briefly, where he described hearing rumours to the effect that Maurice McCabe was “odd” around the time in 2013. The Tribunal continues tomorrow, with evidence from Superintendent Frank Walsh, the former private secretary to Martin Callinan and Nóirín O’Sullivan. Email “Top civil servant says he and Martin Callinan were 'concerned' by Maurice McCabe's whistleblowing”. Feedback on “Top civil servant says he and Martin Callinan were 'concerned' by Maurice McCabe's whistleblowing”.